Watermelon ... Lap Cheong? Who would have thought! One of the best combinations, I dare say after helping myself to one after another. I sat, waited with a grin as I watched my best friend's face light up with a bright smile. He was astonished at how yummy it tasted. At the same time, I was admonished for not making more. "Well, this was an experiment. How was I supposed to know!" I defended myself against the look of displeasure that was made in jest. This is another Christmas creation as you will notice from the colours red and green. It all came about because of my current infatuation with the Lap Cheong. My mint plant has also made itself very at home on the balcony outside. It was spreading like weed. I thought I'd use the two away in a recipe. 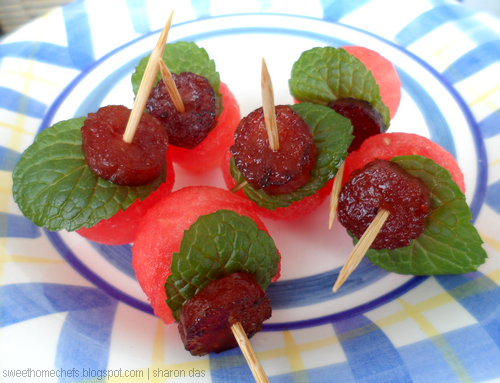 Thus, Watermelon Bites With Lap Cheong was born. 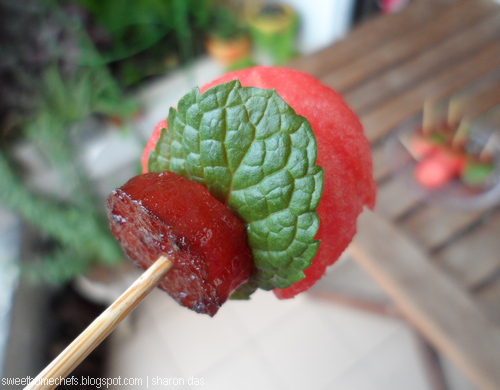 Juicy sweet watermelon, savoury Lap Cheong ; intense flavours that are balanced out with a burst of fresh mint. The mint was a nice touch. Really. Lap cheong (Cantonese) or là cháng (Mandarin) (臘腸/腊肠) is a dried, hard sausage usually made from pork and a high content of fat. It is normally smoked, sweetened, and seasoned with rose water, rice wine and soy sauce. This is the recipe. Easy-peasy! 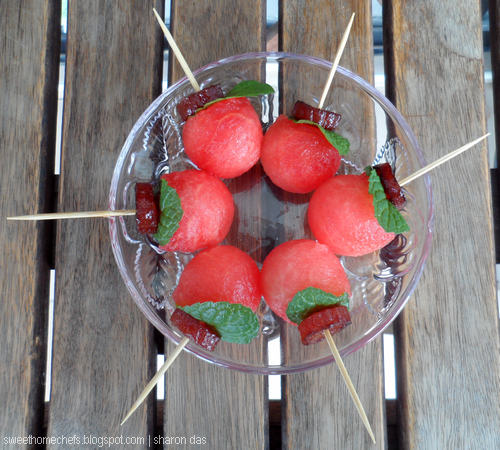 1) Use a melon baller to cut watermelon out into balls. Leave to chill in the refrigerator. 2) Soak the lap cheong in water for about 30 seconds. Peel the casing (outer layer) off. Cut into thin slices. 3) Pan-fry the lap cheong in cooking oil until slightly charred. Then, remove the lap cheong from the pan and place it on a strainer to drain excess oil . 4) To assemble. Press all the ingredients through a toothpick in this order : Charred lap cheong first. 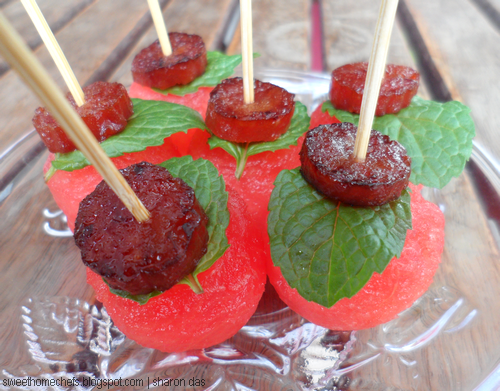 Next, the mint leaf and finally, the chilled watermelon ball. 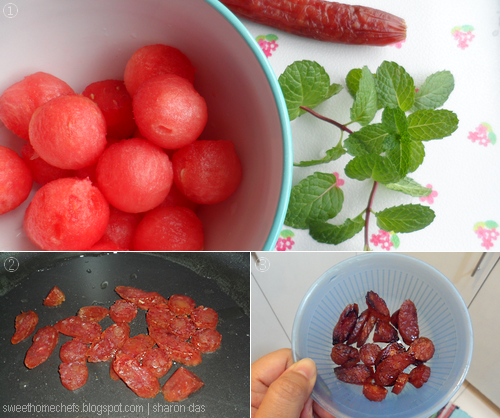 1) Three ingredients - Watermelon, Mint, Lap Cheong. 2) Pan-frying the lap cheong. 3) Lightly charred lap cheong. Arrange the Lap Cheong in this order. Watermelon Bites With Lap Cheong ready to be served! Eat and be merry, for it is good! This is a fun appetizer for all kinds of parties! It looks so tasty! I love watermelon! You're very creative. Merry Christmas Sharon! Thanks, Kanak. I really enjoyed coming up with this one. Happy New Year to you too!